For the past years, Hennessy Artistry Manila have been ruling the party scene because of its commitment to global movement for perfect mixability. 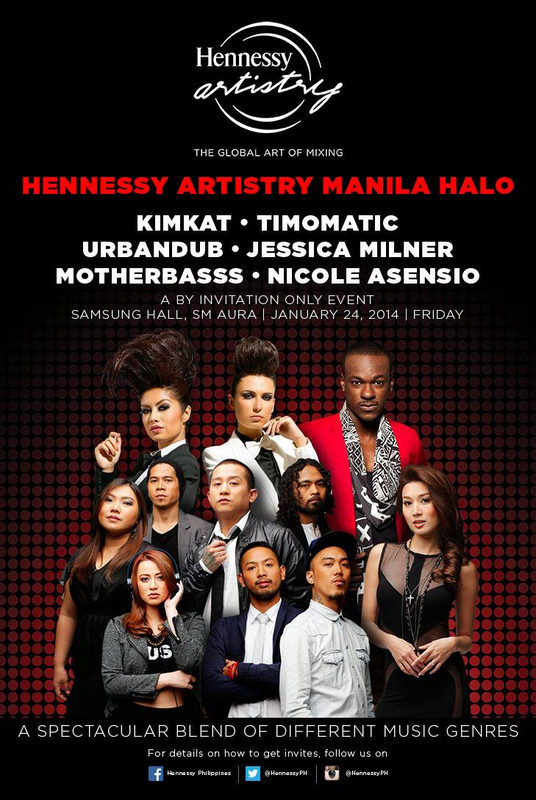 On its fourth year now, it is time again for the party scene to have a taste as Hennessy Manila present's to us: Hennessy Artistry Manila Halo which will be held at the Samsung Hall of SM Aura, The Fort. As always, the combination of the world's best cognac and best musicians from every genre guarantees us of a one amazing night. Welcome to the Hennessy Universe; believe us, you'll never want to leave. Party Door opens at 8pm tonight, Samsung Hall, SM Aura. Headlined by the best International DJ Duo: KimKat also know as Kim Lee and Kat Nova, the crowd will get to experience live their unique brand of house, dub-step, trance and latest electro dance music. There's also going to be collaboration and solo performances by international and local artists highlight of which is Australian pop star- Timomatic who will take center stage and will be joined by our very own Nicole Asencio. Local cult favorite UrbanDub, hip-hop DJ and Drummer Duo Motherbass and DJ Jessica Milner will also perform. In recent times, the country has seen a huge rise in the popularity of international music festivals, but Hennessy Artistry alone takes talents from such diverse and multicultural acts to create a party experience that is both dynamic and harmonious. It's much like Hennessy Cognac itself, taking from the best eaux-de-vie of its cellars to create a blend of distinct notes that come together beautifully on the palate. Hennessy Artistry with its call for "The Global Art of Mixing" has one purpose, to bring together various genres of music from well-established talents and upcoming artists. Blending these acts together with vibrant ambiance and energy results in a truly memorable experience. This showcases Hennessy's art of blending in both cognac and music, by combining tradition with innovation. This global series spins off in over 40 major cities around the world from Hong Kong, Shanghai, Guangzhou, Beijing, Taipei, Tokyo, Kuala Lumpur, Hanoi, New York, Los Angeles, Miami, London, to Germany, Poland, Moscow and South Africa; as it becomes the ultimate international trendsetter of music and style. As in Hennessy Artistry events across the world, our guests get an all access pass to the Hennessy experience with the full universe of Hennessy's mixed drinks based on four basic flavors: Hennessy berry, citrus, ginger, and apple. They are the perfect combination to the world's best cognac. *** photos taken during the presscon at Manila Peninsula's Salon de Ning.